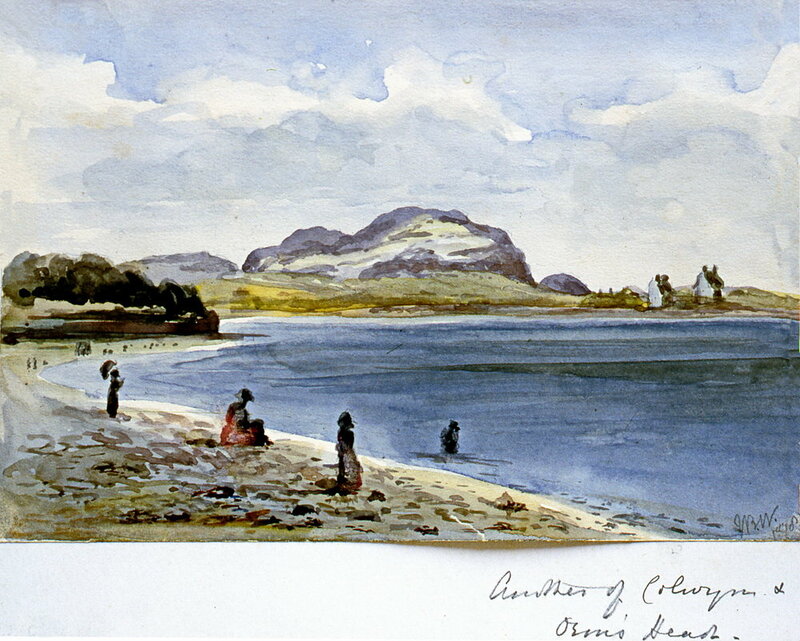 Three Mountains, 1894, Julia Bullock Webster, watercolour on paper, 17.5 x 25.1 cm, 1983.02.01. Gift of Mrs. Barbara Steel. 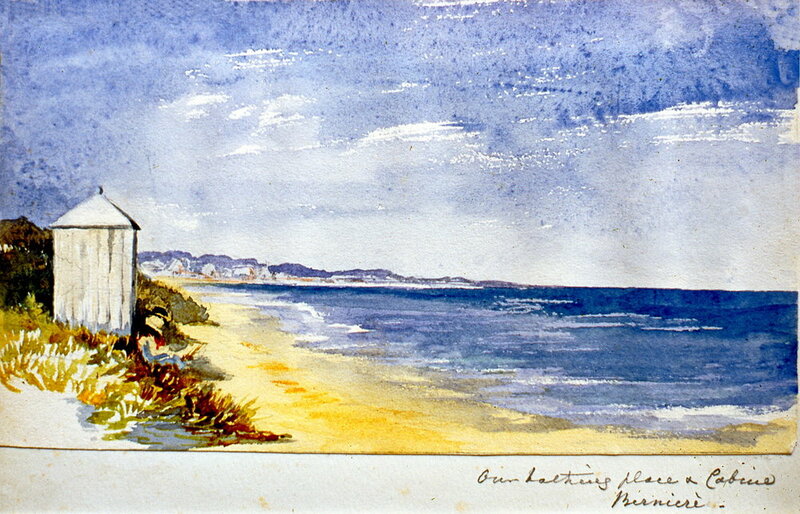 Cawston Bench NE, 1894, Julia Bullock Webster, watercolour, 17.5 x 25.1 cm, 1983.02.02. Gift of Mrs. Barbara Steel. 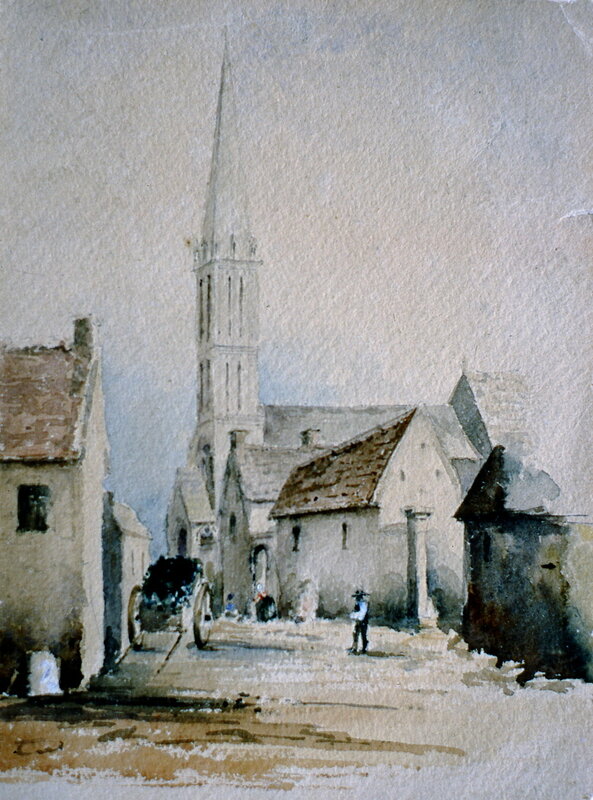 Untitled (Looking East from Ashnola), 1895, Julia Bullock-Webster, watercolour on paper, 25.2 x 34.8 cm, 1983.02.03. Gift of Mrs. Barbara Steel. Untitled (Looking South to Cawston), 1895, Julia Bullock-Webster, watercolour on paper, 17.5 x 25 cm, 1983.02.04. Gift of Mrs. Barbara Steel. 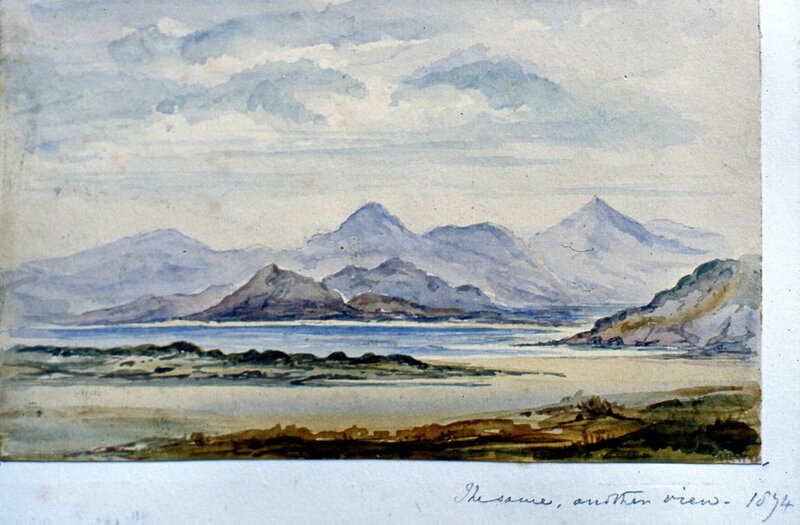 Untitled (Mountains with Cloud Cover), 1896, Julia Bullock-Webster, watercolour on paper, 17.5 x 25 cm, 1983.02.08. Gift of Mrs. Barbara Steel. 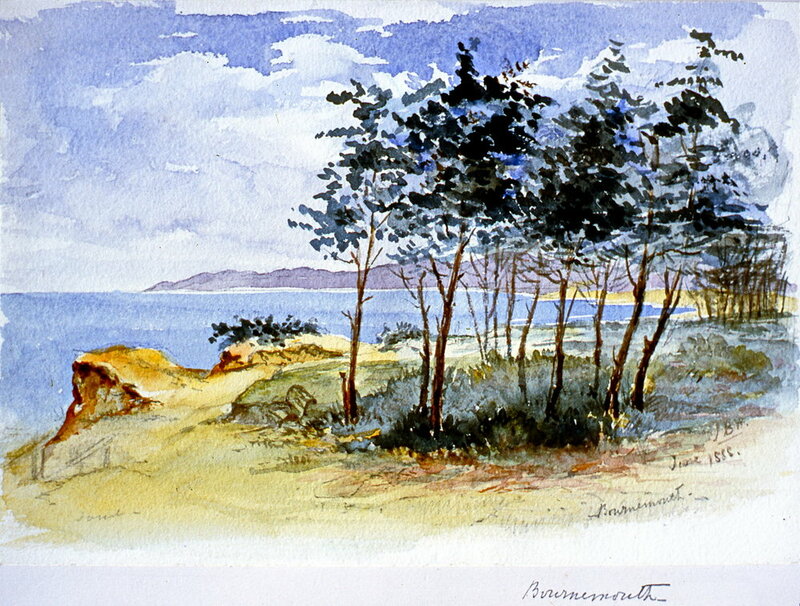 Path Down to the River, Keremeos, 1895, Julia Bullock-Webster, watercolour on paper, 22 x 30.1 cm, 1983.02.05. Gift of Mrs. Barbara Steel. 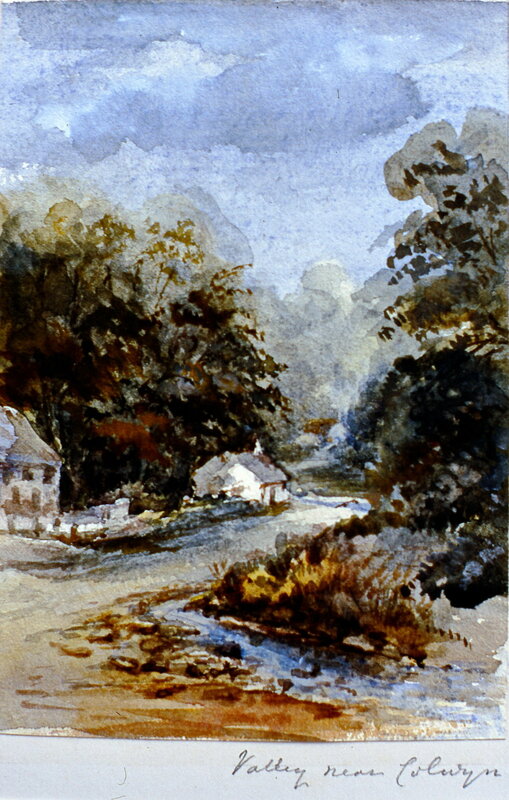 Bullock-Webster Home, 1895, Julia Bullock Webster, watercolour on paper, 25 x 35.3 cm, 1983.02.06. Gift of Mrs. Barbara Steel. 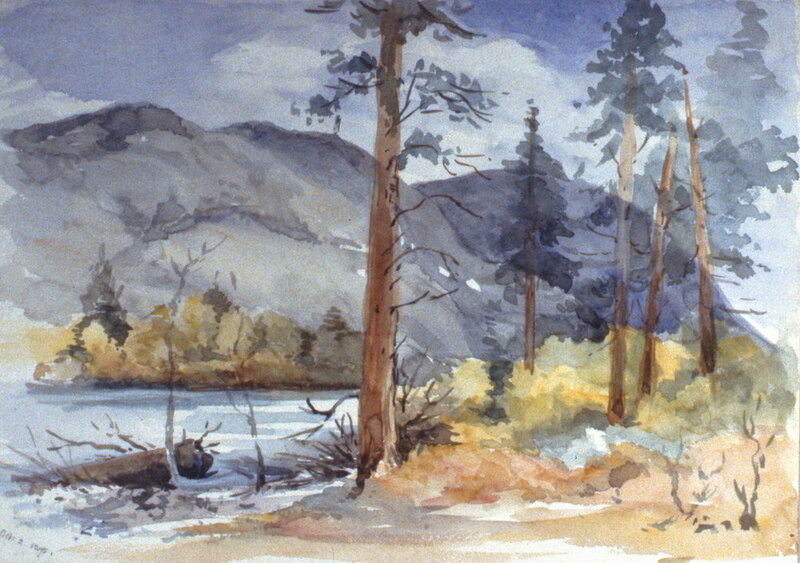 Untitled (Similkameen River Coming from Left), 1895, Julia Bullock Webster, watercolour on paper, 25.2 x 35.3 cm, 1983.02.07. Gift of Mrs. Barbara Steel. 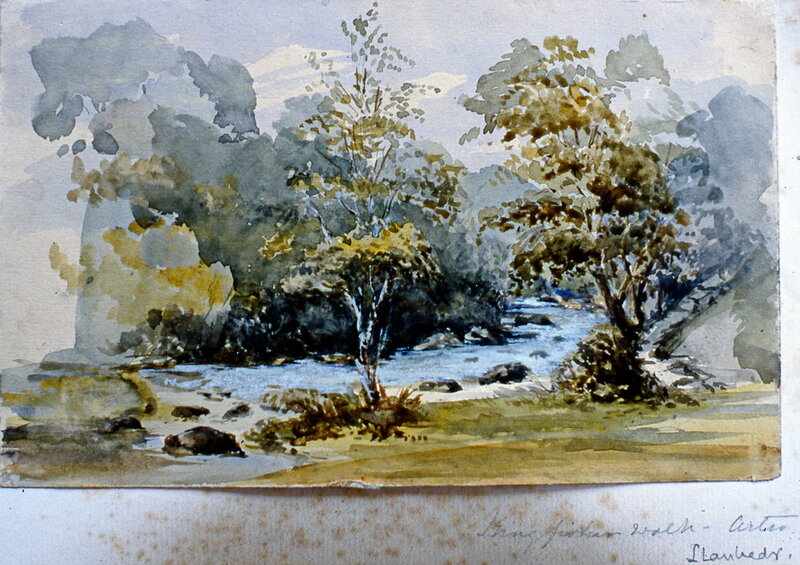 Untitled (Three Trees in Hedley), 1896, Julia Bullock-Webster, watercolour on paper, 22.5 x 32.5 cm, 1983.02.09. Gift of Mrs. Barbara Steel. 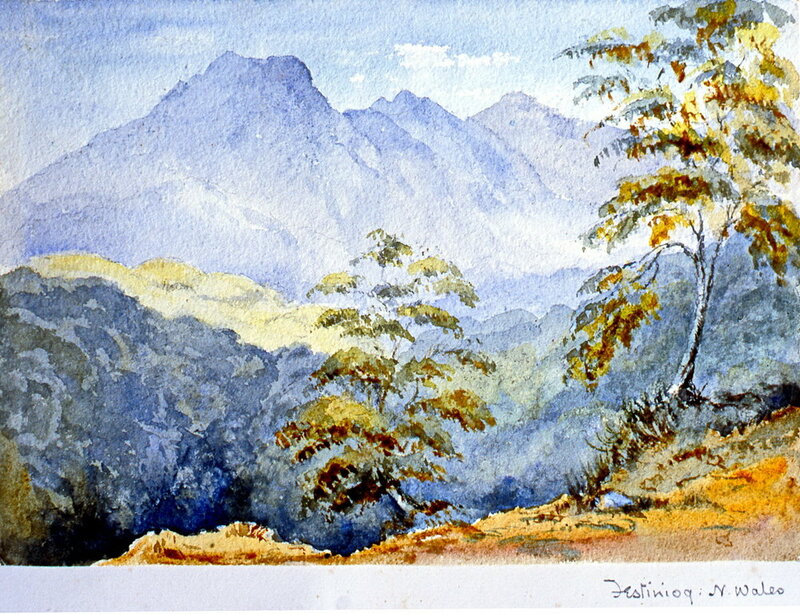 Untitled (Fenche Valley), 1896, Julia Bullock-Webster, watercolour on paper, 32 x 21.7 cm, 1983.02.10. Gift of Mrs. Barbara Steel. 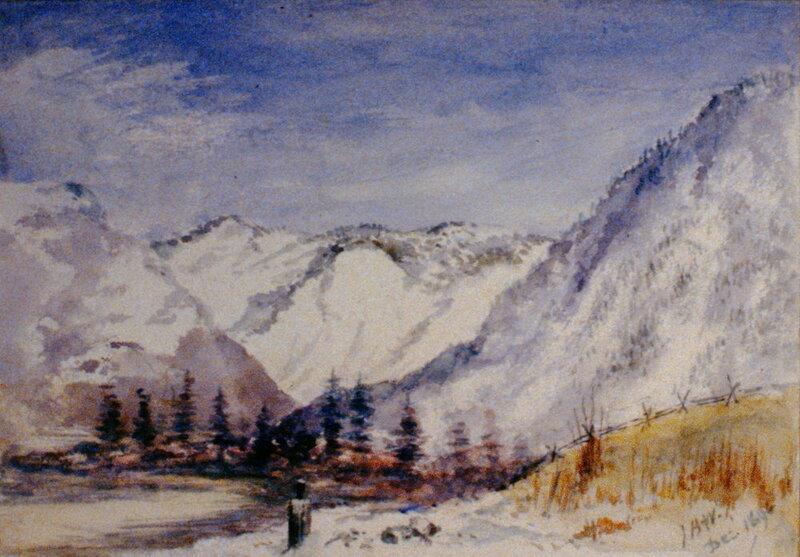 Untitled (Looking From Similkameen), c. 1895, Julia Bullock-Webster, watercolour on paper, 20.1 x 29.4 cm, 1983.02.11. Gift of Mrs. Barbara Steel. 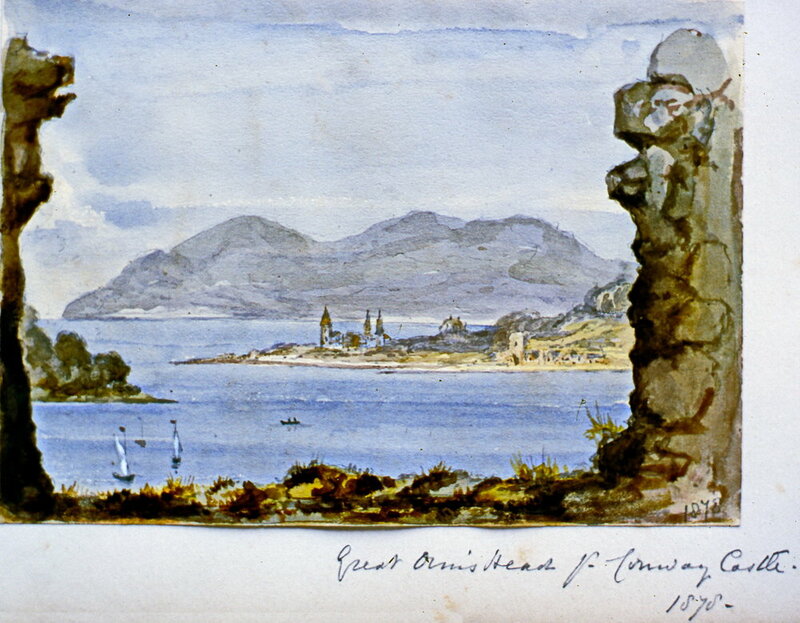 Julia was in her late sixties when she travelled by train from Oxford (her home) to Liverpool, England; thence by steamship to the St. Lawrence River. She crossed the Canadian Prairies by rail, following the route taken by Catherine Schubert thirty years earlier. Once in British Columbia, she boarded a paddle steamer and travelled down Lake Okanagan. Finally, she caught a stage coach to meet her sons in Keremeos. She wrote a meticulous journal of her two-year stay, detailing day-to-day domestic chores and comparing the relative sophistication of English Middle Class life with her experiences in the sparse wilderness of the B.C. Interior. 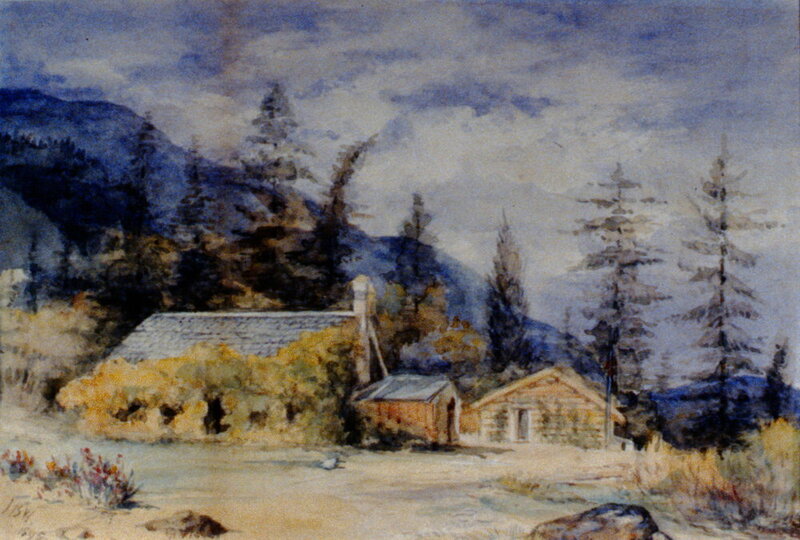 Julia painted watercolour sketches of the abundant local flora as well as many scenes of the Lower Similkameen Valley. 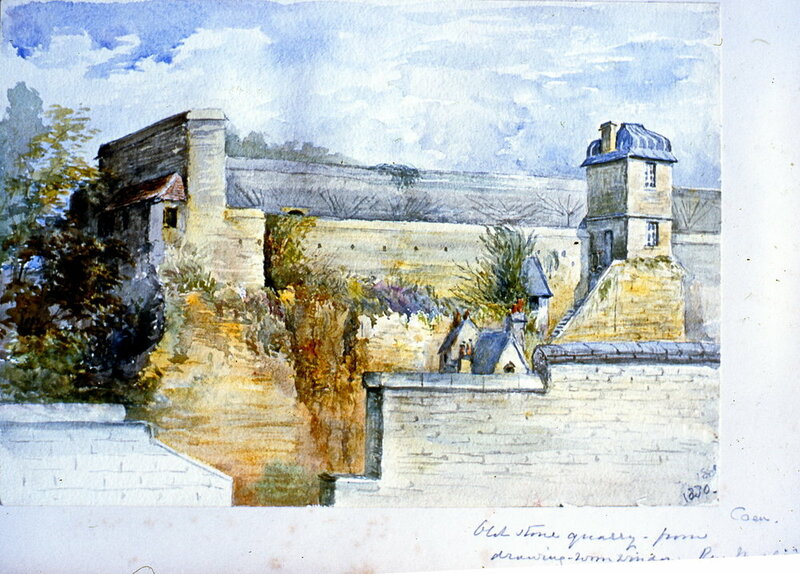 Scarlett Gilia, 1895, Julia Bullock-Webster, watercolour on paper, 35.3 x 25.2 cm, 1983.02.13. Gift of Mrs. Barbara Steel. 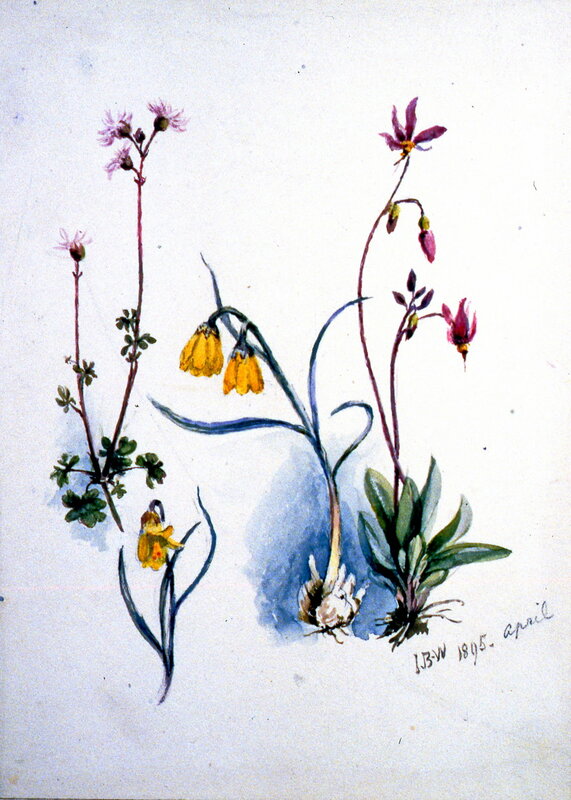 Yellow Bells, 1895, Julia Bullock-Webster, watercolour on paper, 23 x 14.8 cm, 1983.02.14. Gift of Mrs. Barbara Steel. 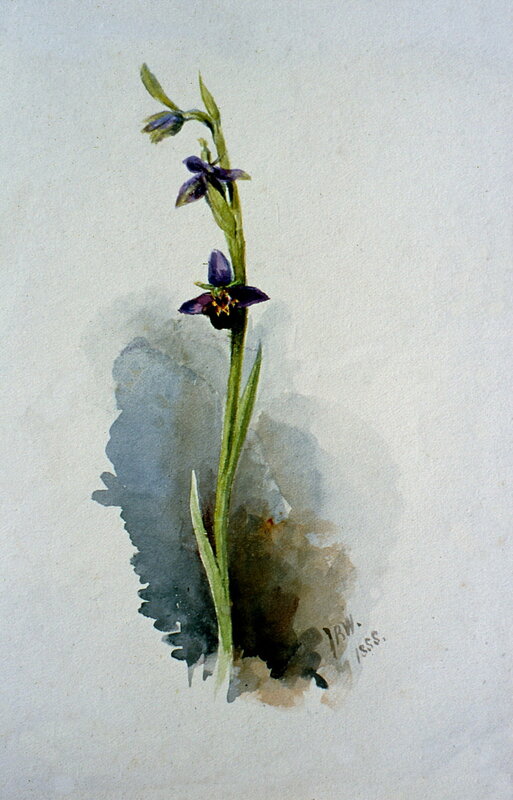 Purple Flowers, 1895, Julia Bullock-Webster, watercolour on paper, 23 x 14.8 cm, 1983.02.15. Gift of Mrs. Barbara Steel. Yellow Lily, 1895, Julia Bullock-Webster, watercolour on paper, 22.6 x 16.3 cm, 1983.02.17. Gift of Mrs. Barbara Steel. 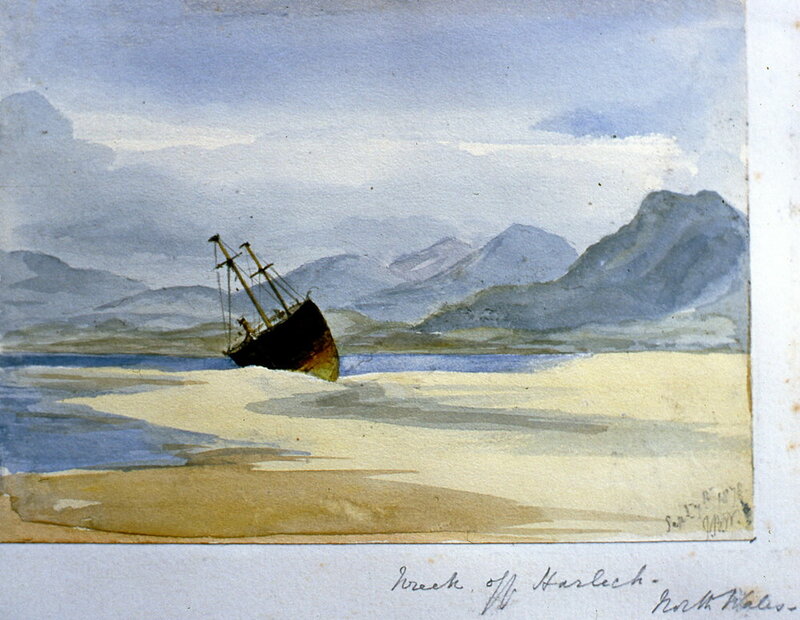 Pink Shooting Star, 1895, Julia Bullock Webster, watercolour on paper, 25.5 x 35.5 cm, 1983.02.17. Gift of Mrs. Barbara Steel. Untitled (Claytonia Carolianum, Doderatheon Jeffrey), 1895, Julia Bullock Webster, watercolour on paper, 25.5 x 35.5 cm, 1982.02.18. Gift of Mrs. Barbara Steel. Pink Daisies, 1895, Julia Bullock-Webster, watercolour on paper, 25.5 x 35.5 cm, 1983.02.19. Gift of Mrs. Barbara Steel. Untitled (Purple Flowers), Julia Bullock-Webster1895, watercolour on paper, 25.5 x 35.5 cm, 1983.02.20. Gift of Mrs. Barbara Steel. 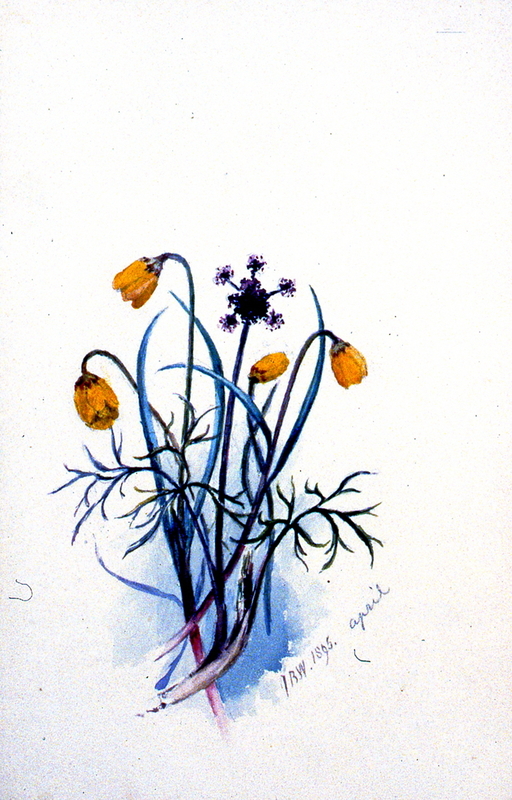 Untitled (Yellow Erigiron Daisies), 1895, Julia Bullock-Webster, watercolour on paper, 24.9 x 35.5 cm, 1983.02.21. Gift of Mrs. Barbara Steel. 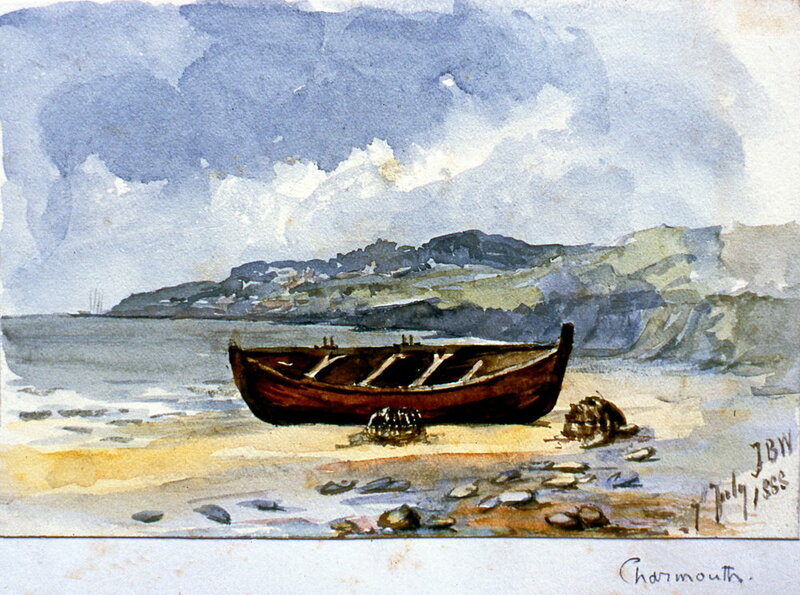 Untitled (Purple Phacilia), 1895, Julia Bullock-Webster, watercolour on paper, 24.9 x 35.5 cm, 1983.02.22. Gift of Mrs. Barbara Steel. Untitled (Leptontaenia, Multifia), 1895, Julia Bullock Webster, watercolour on paper, 35.5 x 25.2 cm, 1983.02.23. Gift of Mrs. Barbara Steel. 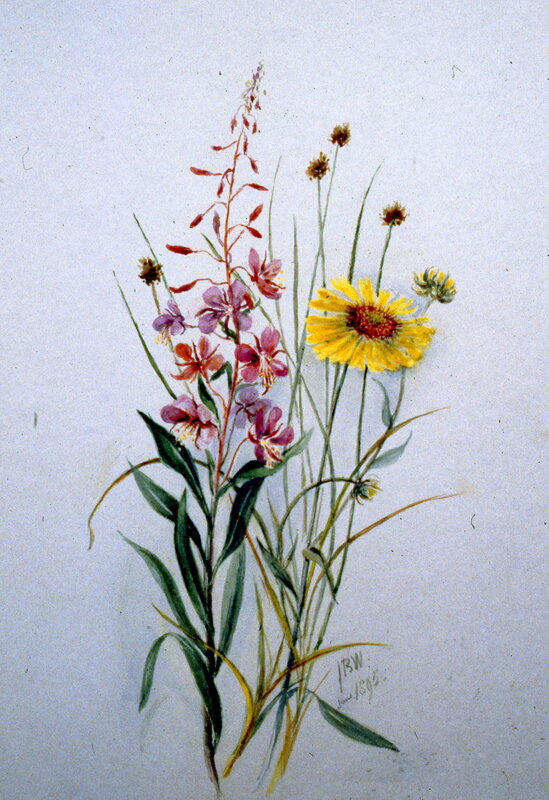 Untitled (Fireweed, Sedse, Brown-eyed Susan), 1895, Julia Bullock Webster, watercolour on paper, 35.3 x 25.3 cm, 1983.02.24. 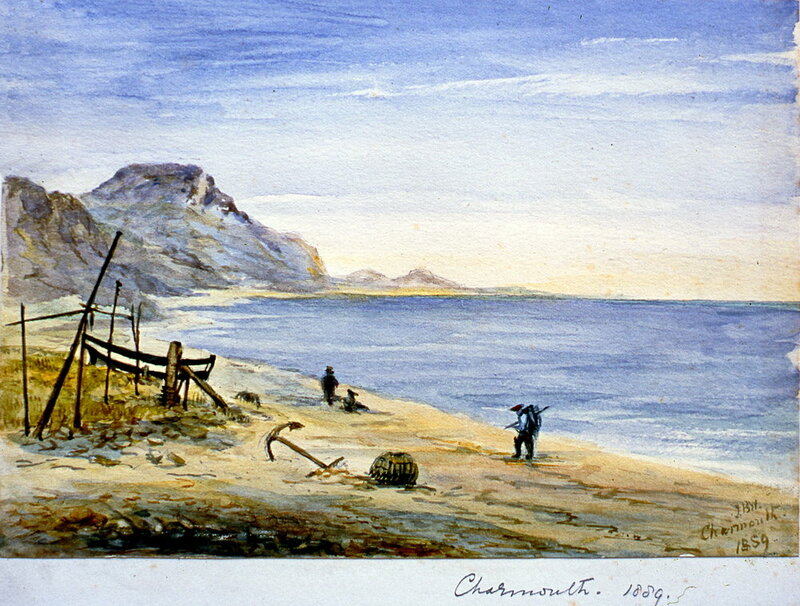 Gathered in Cloverfields, 1895, Julia Bullock Webster, watercolour on paper, 35.5 x 25.5, 1983.02.25. Gift of Mrs. Barbara Steel. Untitled (Thimble Berry Rubus Nutkanus), 1895, Julia Bullock-Webster, watercolour on paper, 16.3 x 22.7 cm, 1983.02.26. Gift of Mrs. Barbara Steel. Autumn Tints of the Willow Herb, 1895, Julia Bullock Webster, watercolour on paper, 35 x 24.5 cm, 1983.02.27. Gift of Mrs. Barbara Steel. 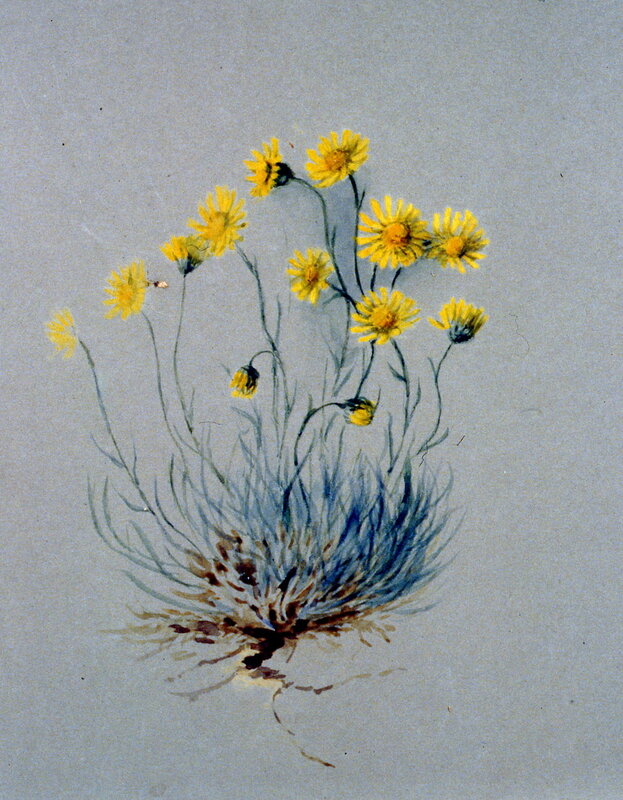 Wild Gaillardia, 1895, Julia Bullock Webster, watercolour on paper. 35.5 x 25.5 cm, 1983.02.28. Gift of Mrs. Barbara Steel. 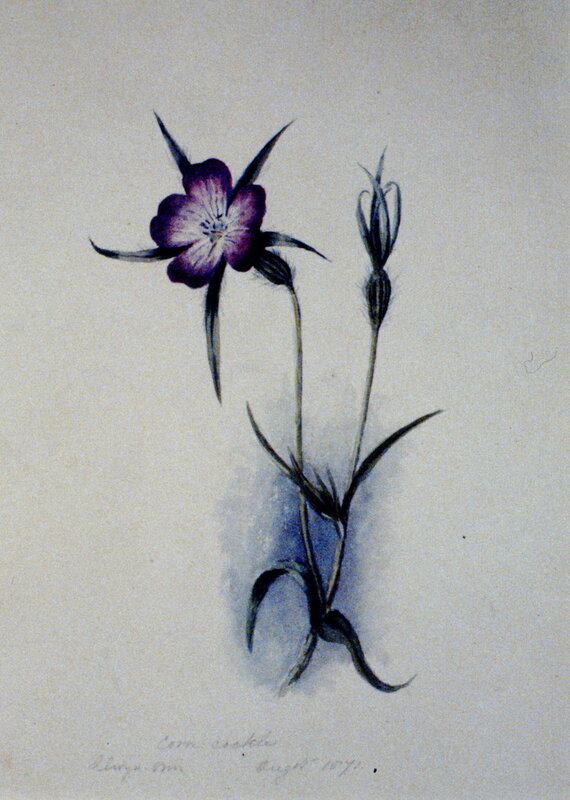 Red Hemp Nettle, 1871, Julia Bullock-Webster, watercolour on paper, 27.1 x 18.9 cm, 1983.02.29. Gift of Mrs. Barbara Steel. 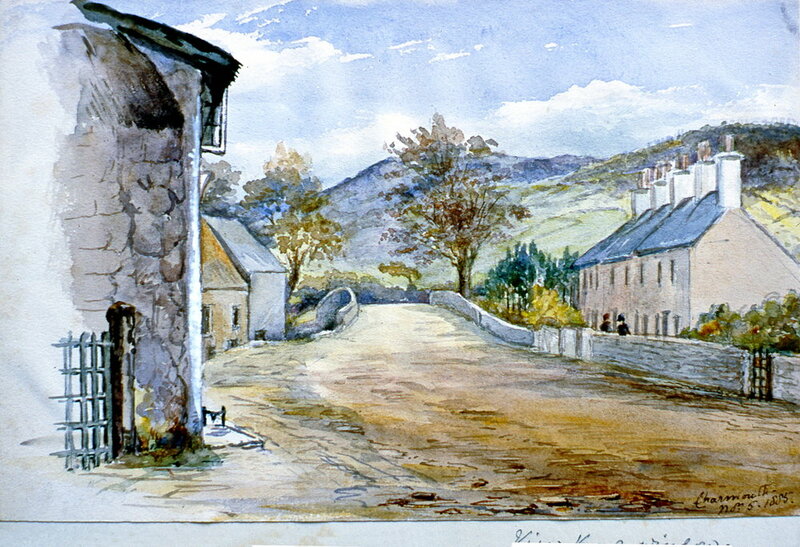 Corn-Cockle, 1871, Julia Bullock Webster, watercolour on paper, 27.5 x 20 cm, 1983.02.30. Gift of Mrs. Barbara Steel. 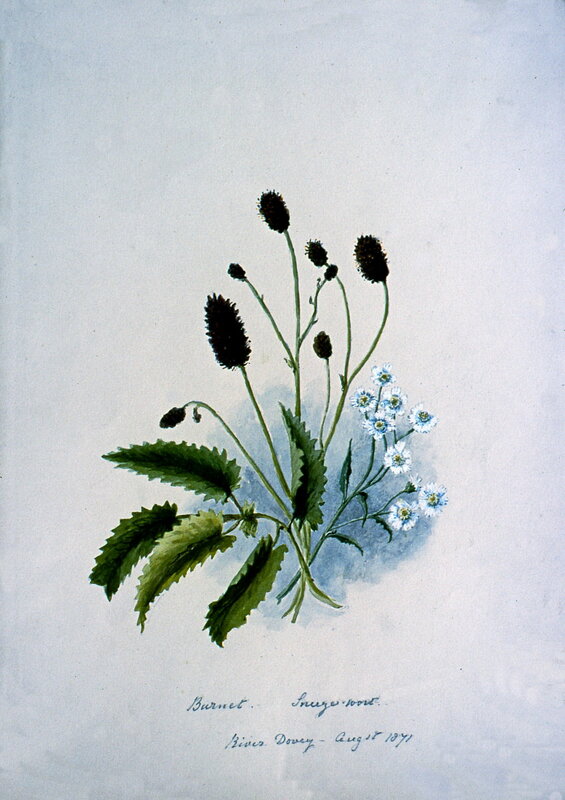 Rush-Scabious- Marshcinquefoil, 1874, Julia Bullock Webster, watercolour on paper, 35.6 x 25.3 cm, 1983.02.31. Gift of Mrs. Barbara Steel. Jeff Head - Stitchwort - Buttercup, 1842, Julia Bullock-Webster, watercolour on paper, 35.5 x 25.2 cm, 1983.02.32. Gift of Mrs. Barbara Steel. Portland Sparge - Pea Feverfew, 1871, Julia Bullock Webster, watercolour on paper, 35.5 x 25.8 cm, 1983.02.33. Gift of Mrs. Barbara Steel. 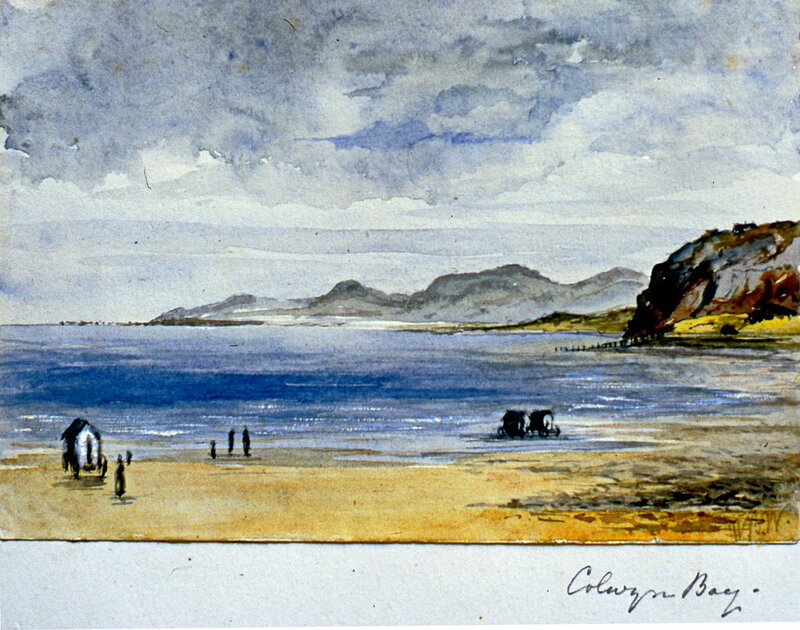 Mountain Rose - North Wales, 1879, Julia Bullock Webster, watercolour on paper, 35.5 x 25.3 cm, 1983.02.34. Gift of Mrs. Barbara Steel.